Vilalba is located in Galicia, Spain and dates back to the Paleolithic age. Vilalba is located in the northern region of Galicia and dates back to the Paleolithic age. Rich in history, there are several ancient remains of old hill forts and Roman sites in this area. It is also surrounded by many beautiful lakes and rivers, and family run farms. Throughout the centuries Vilalba was an important crossroads for many prestigious routes such as the pilgrimage to Santiago de Compostela and the Royal Road to Betanzos and A Coruna. During the 15th century it was closely linked with the Counts of Andrade who built an imposing castle here. However all that remains of the original fortress is the Keep which has since been converted into the Parador Vilalba (Hotel Condes de Vilalba). The Parador is ideally located just around the corner from the town square, and decorated in murals and various coats of arms it has retained a medieval atmosphere. If you are particularly interested in ancient culture and history you should visit the Museum of Prehistory and Archaeology which is located in the old prison. Some of the more interesting churches to explore are the Santa Maria and San Roque. One of the best times to visit Vilabla is in the spring when the town holds the San Simon Cheese Fair, for this is where the famous smoked San Simon cheese is made. From August to October there are always celebrations going on including a popular pilgrimage that crosses over the River Magdalena. But the final event of the year is in December when the town holds its annual fair, the Fair do Capon. Beyond Vilalba there are also a number of wonderful places to visit, each a marvellous way to fill your afternoons. You could begin by relaxing in the thermal waters of Alligail or alternatively tour the coastline. To the northeast is the town of Foz which pre-dates the Roman era and has two forts that are still standing today, the Fazouro and Pena do Altar. During the 5th and 6th centuries Foz received many Britons fleeing from the British Isles. 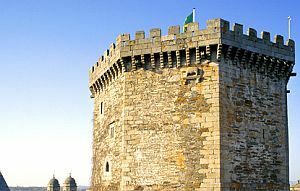 It started out as a small fishing village but by the 17th century it had became a major port and one of the most important shipyards in Galicia. It focused mainly on Whaling and when the industry eventually died out it lost its status as a major port. Nowadays it has become more of a tourist spot. Heading west from Foz you will come to Burela which is another coastal town that also pre-dates the Romans. The first reference to Burela was documented in 1096, and unlike Foz is has remained an important fishing port. Here you will find the ruins of a Roman villa and an ancient fort that stands at the end of the cape. If you drive directly west from Vilalba you will come to La Coruna. There is a wonderful sea front promenade which you can stroll along, and the old quarter has several ancient monuments including some 12th century churches. The Castle of San Anton was built in 1843 and is the final resting place of the British general, Sir John Moore. The General was honoured here for defeating the French during the Battle of Coruna. However, the town's most important monument is the Tower of Hercules which was built during Roman times. It is in fact a lighthouse and stands over 57m high. To say it is impressive is an understatement, and if you come to Vilalba for a holiday this is definitely a ‘must see’ whilst you are here.